As I sit down and write this evening I cannot help but to think how busy things are starting to get, and it isn't even springtime yet. As with any real estate office, we are usually busier during the summer months when the grass is green and the water is not frozen. As a primary land and ranch broker, that is definitely the case for me, but it seems as though we are getting started a little early this year. I cannot complain and am looking forward to another great summer, but I must take the time to enjoy the winter season and all it has to offer those that spend their time here. 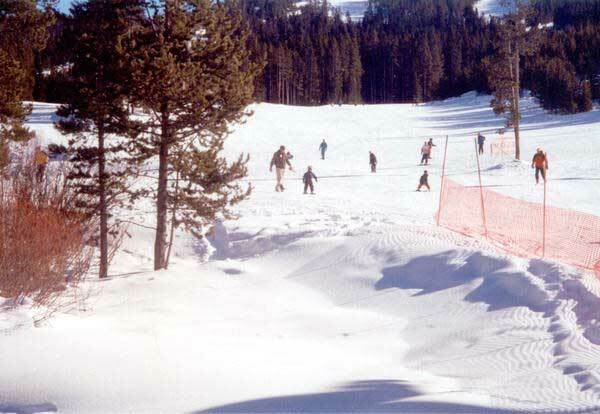 There are so many opportunities for the folks in the Pinedale area, and the newest and greatest has been the addition of the local ski area known as White Pine. There is no doubt that it has been awhile in the making, but it has earned the hot spot for winter recreation in our little town. People have become addicted to "the hill " in ways that cannot be described. Our neighbors who once were seen around the house all weekend long have since become regulars at White Pine and enjoy every last ounce of daylight on the new mountain. The father of the Family (Scott) has exhausted himself with the new sport, and I observed yesterday that he recruited his wife to drive home from the mountain while he caught a few winks in the passengers seat. As for our family, well, we are well on our way to joining in on the newest fad and have "gotten our feet white" you could say. Last year we made 3 or 4 trips up the big hill, and this year it has been very enjoyable to share the event with our 3-year-old son. It is amazing how fast the youngsters pick up on things like this, and I have noticed from observation that it is not long and the kids are better than their parents who taught them. 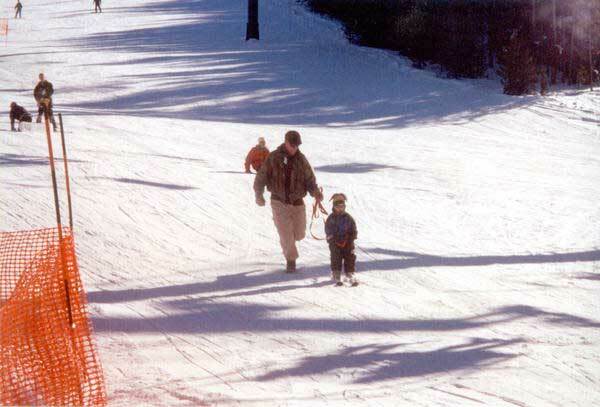 I have certainly played the teaching game safe and have not yet ventured on skis myself while teaching Clancy everything I know. My wife has seen me ski and knows my coordination abilities. She advised me to just keep my snow boots as an instructor. 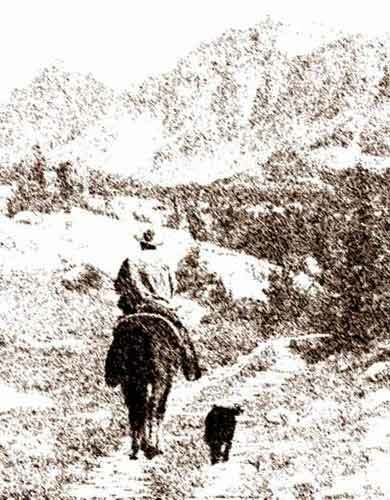 I have a feeling that by next year we will be clear to the top of the mountain and I will be struggling to keep up. 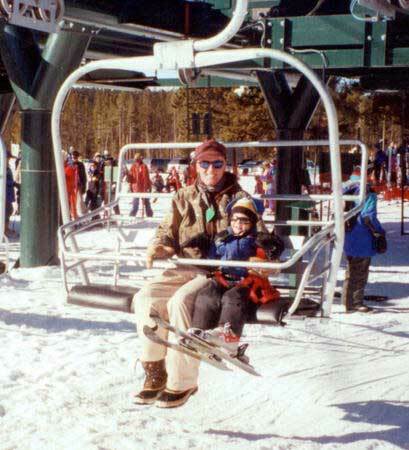 The first time I took Clancy up to White Pine I had no intention of getting on the lift and had actually made a promise to my wife that we would not attempt it since she was not around. After dragging the kid up the side of the hill 3 times and shedding my entire winter attire, I decided that the lift could certainly not hurt. Our concern before we left the house was that Clancy might not like being up in the air that far and would get scared with no way to get him down until we got to the top. We had a similar experience with a ride at the fair in Jackson this past summer and we did not want to re-enact the event. After a pep talk and consultation with his Grandma, who happened to be up there that day, we decided to give it a shot. We made the first trip up the hill in great shape and by the second trip Clancy thought "the fair" (chair lift) was the greatest part of skiing. It just happened that about the time we were close to getting off the chair on the second trip my cell phone rang and it was my wife. I had to tell her that I would have to call her back because I was busy but I did not have time to tell her what I was busy doing. You can imagine what happened when I called her back to tell her the great news of how Clancy had mastered the chair lift without his mom knowing. Let's just say that I am still alive today and grateful to be sharing the story. 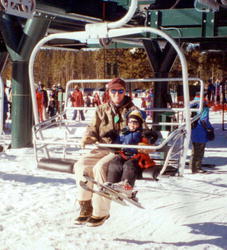 In all seriousness, it is a great family event and we look forward to every chance we can get on the slopes. The atmosphere of White Pine has definitely been geared for families and a place you will surely want to spend some time while you are off the paved road. Click on small thumbnail pictures to see a larger version. Copyrights: Photos by James Rogers, 2001. Graphics by Pinedale Online, 2002. All content copyrighted by Pinedale Online. No part may be reproduced without permission.